Cute! 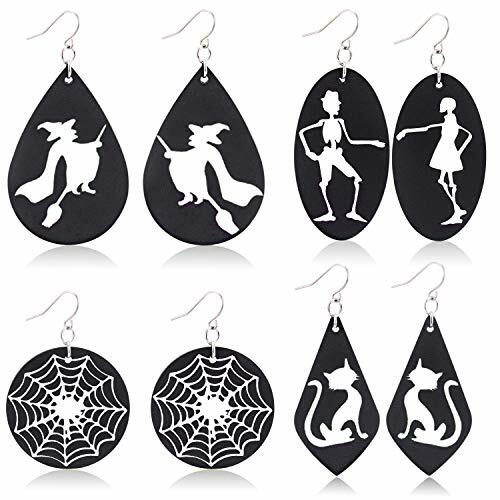 4 Pack of Halloween Earrings $6.64 SHIPPED! Be sure you clip the extra 5% off coupon! ❤PACKING INCLUDING:There have 4 pairs halloween dangle earrings,dancing skull skeleton earrings,black cat earrings,witch earrings,cobweb spider earrings,we believe these unique design earrings will make you conspicuous and catching eyes. ❤FUNNY & PREMIUM QUALITY:This speical halloween drop earrings were made of high quality genuine leather,stylish halloween theme patterned was make of glow in the dark material,when these earring absorbs enough light,whether it is sunlight or light,it will have a green luminous effect at night. ❤EARRINGS MEASURES:The size of tear drop earrings was approx.1.5" x 2.5",the size of the round drop earrings was approx.1.7" x 1.7",the size of the oval drop earrings was approx.1.25" x 2.5",the size of the geometric shape earrings was approx.1.25" x 2.5",such a cute size to fit most people. ❤BEST GIFT IDEA:Halloween is just around the corner and it's time for you to show some spirit!This stylish halloween genuine glow in the dark earrings was perfect for wearing to the Halloween Party or showing your love of the Holiday all season long. ❤CUSTOMER GUARANTEE POLICY:We provide 100% 30-day money back guarantee if you do not like the halloween earrings or any other reason.